Samsung had a better than expected holiday season despite the loss of its flagship smartphone for the second half of the year, the Galaxy Note 7. While Apple’s iPhones collectively accounted for an estimated 44% of all holiday activations while Samsung phones accounted for just 22%, Samsung’s estimated share of activations during the period actually climbed 1% compared to the holidays in 2015. But now, all attention turns to the future and Samsung is wasting no time in the new year. Early Monday morning, Samsung took the wraps off of three different Galaxy smartphone models that will begin launching just a few weeks from now: The Galaxy A7, Galaxy A5 and Galaxy A3. Although most Android fans are dying to know exactly what Samsung’s flagship Galaxy S8 has in store for us, the Galaxy S series is just one piece of a much larger smartphone portfolio for Samsung. And before we get to the Galaxy S8 in 2017, Samsung has several other new handsets to show the world. 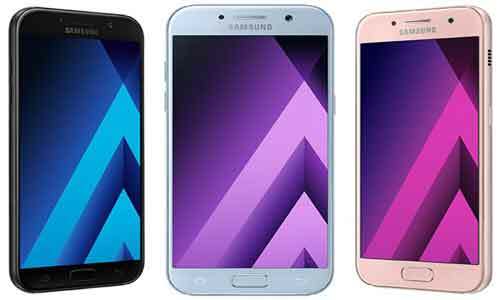 First among them are a trio of sleek metal smartphones that fit into the company’s Galaxy A lineup. While all three phones feature similar metal designs, they vary rather dramatically in terms of size and specs. The high-end Galaxy A7, pictured above on the far-left, sports a large 5.7-inch 1080p Super AMOLED display, a 1.9GHz octa-core processor, dual 16-megapixel camera (front and rear), a 3,600 mAh battery, 3GB of RAM, 32GB of storage and microSDXC support up to 256GB. The mid-size Galaxy A5, pictured above in the middle, features a smaller 5.2-inch 1080p Super AMOLED display, a 1.9GHz octa-core processor, dual 16-megapixel camera (front and rear), a 3,000 mAh battery, 3GB of RAM, 32GB of storage and microSDXC support up to 256GB. Finally, the smaller Galaxy A3 (top left) includes a 4.7-inch 720p Super AMOLED screen, a 1.6GHz octa-core CPU, a 13-megapixel rear camera, an 8-megapixel front-facing camera, a 2,350 mAh battery, 2GB of RAM, 16GB of storage and microSDXC support up to 256GB. All three Galaxy A series smartphones feature IP68 dust and water resistance, as well as the Android 6.0.16 Marshmallow operating system. They’ll begin rolling out in Russia in early January, followed by launches in additional markets. Full specs for all three models follow below.